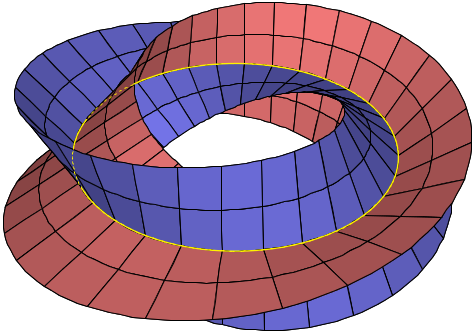 Let $M$ denote the open Möbius strip, and $\pi:M\to\mathbb S^1$ be the $\mathbb R^1$-bundle. Prove that Whintney sum $\pi:M\oplus M\to\mathbb S^1$ is the trivial $\mathbb R^2$-bundle. I have no idea. Any advice is helpful. Thank you. Not the answer you're looking for? Browse other questions tagged vector-bundles klein-bottle mobius-band or ask your own question. Is there a nice picture of the direct sum of two Möbius bundles? Why is Klein bottle non-orientable? Why can one discriminate between the trivial $S^1$ line bundle and the Möbius strip by knowing the fibre transformation group? How to find two inequivalent ,but weakly equivalent bundles? Where did this useful matrix decomposition come from for Nodal Analysis?